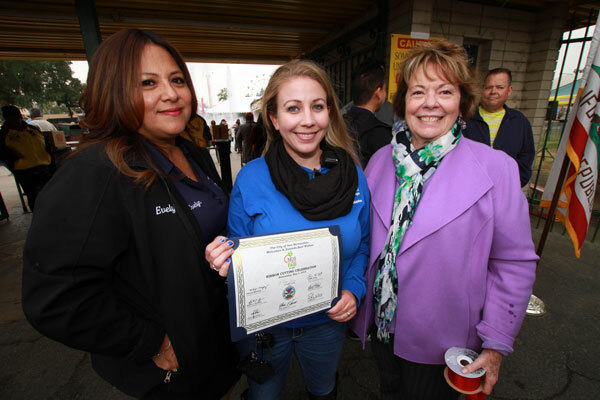 Photo/Ricardo Tomboc: Photo 6: Evelyn Estrada (L) from the San Bernardino Mayor’s Office presented NOS representative Rebecca Ward (middle) with a certificate of recognition. Also pictured is San Bernardino Area Chamber of Commerce President and CEO Judi Penman. 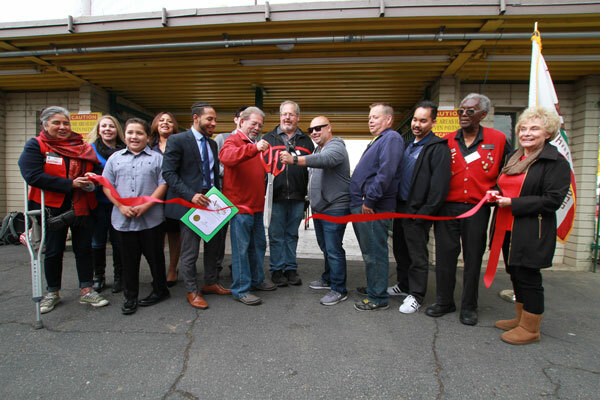 The San Bernardino Area Chamber of Commerce held a Ribbon Cutting Ceremony for the 2018 103rd Grand Opening of the annual National Orange Show Citrus Fair. San Bernardino Chamber President and CEO Judi Penman and several Chamber members, along with National Orange Show (NOS) representatives, conducted the ceremony and welcomed everyone attending the event. Evelyn Estrada from the San Bernardino Mayor’s Office presented NOS representative Rebecca Ward with a certificate of recognition for the ribbon cutting ceremony. Field Representative Joshua Monzon from the State Senator Mike Morrell’s office, and Field Representative Darrell Frye from the State Assemblymember Eloise Gomez’s office also presented Miss. Ward with a Certificate. The Orange show hosted an “All California Juried Art Exhibition,” where several pieces of art were on display in the Renaissance building. San Bernardino Valley College also had its own Art and Photography Exhibition in the Citrus building. The San Bernardino Unified School District had a STEM display and workshop for younger attendees. San Bernardino City Unified School District Board Member Michael Gallo met and greeted people entering the exhibit during the grand opening event. Norton Elementary Tech Club members and their Principal Elizabeth Cochrane-Benoit worked on several CAD (computer assisted design) and 3D printing projects. In addition to the many exhibits at the fair, there were pig races, Fido 500 mini Dog Race, Venardos Circus act, turkey race, and a live shark exhibit, while bands played on two separate stages. The Orange County Module Railroaders Club had a large HO model train exhibit. Railroaders Club President Don Berezin said the club has been exhibiting their trains at the NOS Citrus Fair for about 8 years. On Sunday, May 6ththe NOS Fair dedicated the day to celebrate Cinco de Mayo, ending the festivities with a fireworks display. There was lots of Mexican music, food, and festivities. Photo/Ricardo Tomboc: Photo 3: The San Bernardino Area Chamber of Commerce held a ribbon cutting to mark the commencement of the National Orange Show’s 103rd Citrus Fair along with NOS representatives.